The suckling pig’s taut skin glistened a burnished chestnut in the dim dinner lighting. A layer of silky fat glistened beneath the crackling. Roasted whole, it was rich, salty and still smiling. Our table agreed: a toast was in order. On cue, a waiter arrived with two bottles: Coronado Brewing’s Stingray IPA and Pelican Brewing Company’s Umbrella IPA. 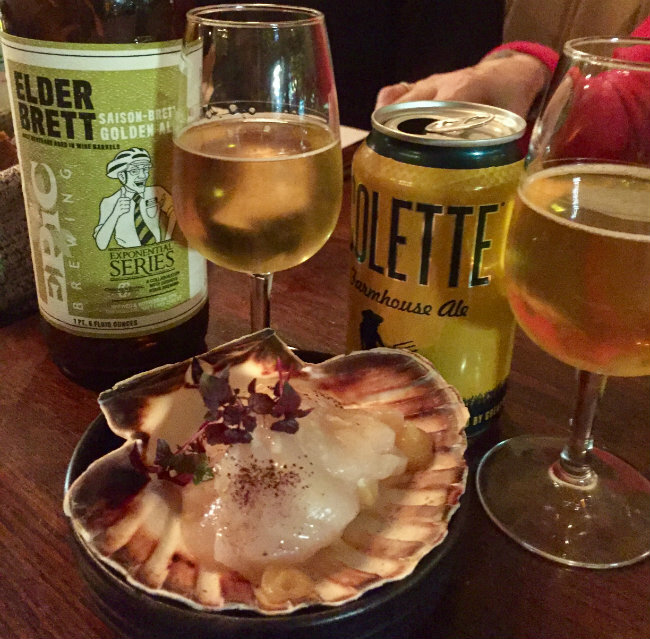 “IPAs balance the palate in two ways: they cut through the fat and counteract acidity,” explained chef Adam Dulye as we gleefully tore in. Besides being a world expert on matching food and beer, Dulye is Executive Chef for the Brewers Association (BA), a not-for-profit trade body that represents small and independent American craft brewers, their beers and a community of brewing enthusiasts. The suckling pig was the penultimate dish in a five-course-ten-beer menu crafted with Le Grand Bain chef Edward Delling Williams and designed to demonstrate that American craft beer is as compelling an accompaniment to good food as any wine. Oysters on the half shell; asparagus dotted with grapefruit and egg; scallops in a miso bath; seared tuna; slow roast pig and lamb shoulder; white chocolate mousse with hay ice cream – paired with two beers from the BA’s Export Development Program, each course highlighted current popular beer styles – Kölsch; IPA, Pale Ale, Saison, Barrel-Aged, Sour – and their ability to complement and enhance a variety of food. 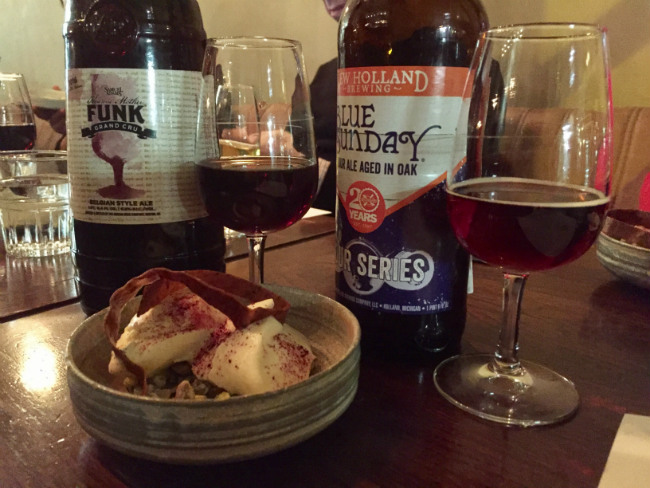 An all-beer dinner pairing in France no longer raises eyebrows the way it might have five years ago. 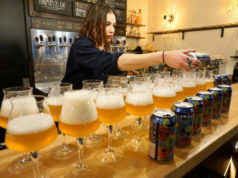 “Craft beer appreciation is growing rapidly in France and we are entering the market at the birth of the French craft beer scene,” says Dulye. “It is new, young and dynamic, and represents an exciting prospect for American craft beer.” According to Brasseurs de France, the French association of brewers, there are currently over 800 breweries in France; that number is expected to reach 1000 by 2019. Although 70 percent of beer consumed in France is produced domestically, a large portion of the market remains friendly to foreign brands. According to Dulye, France is a perfect next step for the BA’s Export Development Program, which has been educating international trade and media about the quality and diversity of U.S. craft beers and U.S. craft beer culture since 2004. The beer pairing dinner is an example of how the program reaches foreign markets through collaboration with local businesses. “France is enjoying a craft brewing renaissance as French people wake up to the wonderful world of flavors found in beer. Interest is growing not only for domestic breweries but international ones too,” says Dulye. For proof, just visit any French craft beer bar or bottle shop – you’ll find anywhere from a handful to crowded shelves of imported beers. That said, it’s hard to say just how much exports to France have increased. The movement toward craft feels enormous on the ground, but the market is so small that the BA rolls it in with total export figures of American craft beer, which are up 4.4%. Still, local bars like Les Trois 8 and Le Grand Bain are happy to be a part of the expanding influence American exports are having on the world’s palate. 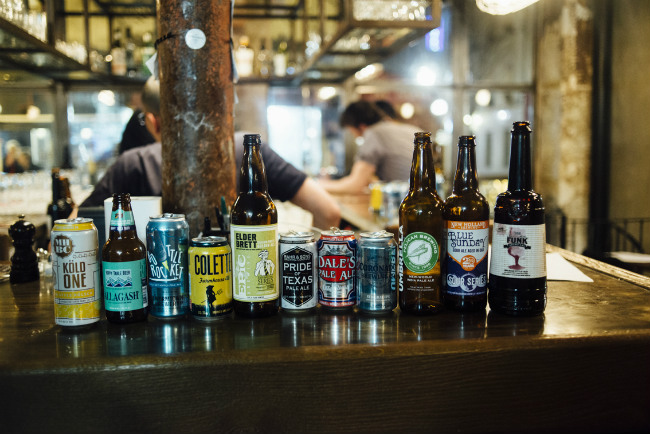 “This kind of program supports the interest in craft beer that is developing at the moment and encourages the trend towards well-crafted styles,” says Julien Tisserand, co-owner of Les Trois 8 and Outland Bar in Paris. Last year, as part of the EDP program, the bars received a pallet of beer handpicked from among the 100 member breweries and air-shipped to France to preserve freshness. Patrons the had the chance to discover the beer during dedicated evening events. “The market is still in its infancy. French brewers are now offering beer that is as good as anything being produced in the U.S. or Europe, but there’s still room for other brands and we welcome them,” adds Tisserand. The BA’s Export Development Program has allowed breweries like California-based Coronado Brewing to reach international markets, including France. “Coronado Brewing Company works with the BA’s Export Development program to assist us in growing our business internationally,” writes Rick Chapman, President of Coronado Brewing, in an email. 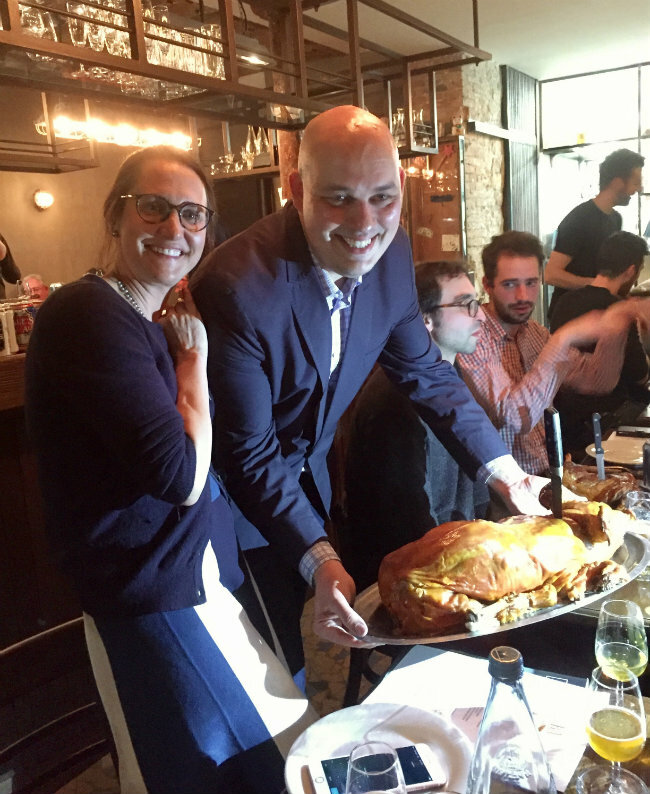 The brewery’s Stingray IPA shared the limelight with the slow-roasted pig that stole the show at the BA’s dinner. “We are always excited to work with the BA’s Chef Adam Dulye, and we are honored when he chooses to use our beers in his collaborations… He understands how to thoughtfully pair our beers to create amazing experiences. 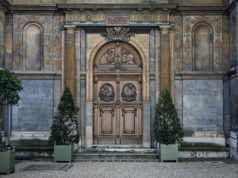 My only regret, is that I was unable to attend this year’s event in Paris,” wrote Chapman. Kate Robinson is a freelance writer and editor in Paris. When she’s not drinking craft beer, she can be found planning her next outdoor adventure.